Now before getting to the question that is at the forefront of everyone’s thinking, namely: what were the women like? (and rightly so: there is hardly any question that is more important) I want to give a general overview of the city. The wall is long since down, so the economic dynamics have changed. 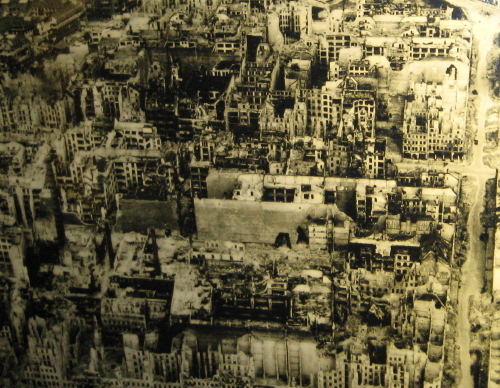 The Kurfürstendamm was the west’s great shopping boulevard before the wall fell, but after the fall, there were historically more apt areas, to which the center of gravity naturally shifted. But in the meantime, the heavy subsidies from the Federal Government fell off; the misallocation of resources coupled with less of them has created a pinch. People have moved away. Unemployment is in the double-digits. The Ku-Damm still has a lot to offer. I saw Mephisto shoes for just a little over half what I paid at Nordie’s. So shoppers– plan ahead and you may be able to pay for part of the trip with the savings. That’s not my cup of tea, however. In Berlin after New Year’s eve, there was trash everywhere. Apparently it’s a huge party. People come in from all over. At a bar the next day, I met four nice Spaniards that had come to Berlin just for the New Year’s celebration. Apparently Berlin is in Europe what Times Square is for us. But don’t you do it! I heard horror stories about firecrackers and sirens continuing until 5 in the morning. Fortunately, I was staying in the little town of Seelow that night. Even there, firecrackers kept going off every six seconds until two in the morning. It’s so boring. I pity the young boys setting them off. I should think catching frogs would be much more interesting. Kleist Park is a small part with a court building on one flank. The tour guides celebrate this as a place of alleged National Socialist show trials. At the other end of the park is this nice flank of columns– except of course the context is all wrong. Perhaps this is the place to make a general comment about the architecture of the city. There are three kinds: the grand, the stately-traditional, and the modern. The modern is either dismal or creative. 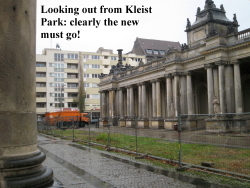 Often the stately and the dismal are mixed together, as the Kleist park colonade illustrates. The Kreuzberg is kinda cool. My camera ran out of juice unfortunately. The cross at the top used to be visible for miles, and represents the cross that became a coveted soldiers medal. At the top of the memorial a janitor was patiently sweeping up the mess left by the New Year’s Eve parties. Schweine, I said. Ja, he said. There was instant understanding, across lands and sea, generations, and nationalities. It should be mentioned that most Berliners do not litter. I saw many going out of their way to deposit trash properly. There must be something about the party spirit; maybe all the foreigners in town. The Schoeneberg Rathaus is where Kennedy made his famous speech. Germans fell in love with Kennedy. He landed in Frankfurt, made a speech there too I believe, then motorcaded all the way to Berlin. When he died, tens of thousands gathered to memorialize. Just like everyone here 50 or older remembers where he was when Kennedy was shot, so do the Germans. Nearby is an ugly reminder of the post-war. 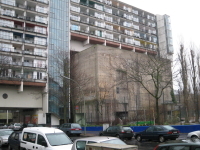 This apartment complex was built right over an anti-aircraft bunker. Apparently there was simply too much steel and concrete to be able to remove it first. The Soviet Denkmal is “impressive”– like our own Lincoln Memorial, it still rears its ugly head years after the war criminals should have long since been recognized and exposed. The 1936 stadium is grand. I put my photos of it here. 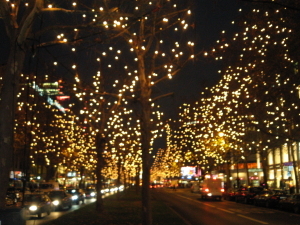 As mentioned, the shopping street Kurfürstendamm is still nice, at least at the holidays. I stayed just off it on Fassinenstrasse. 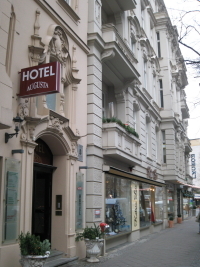 Though it is right in the heart of the elegant shopping district, I was able to get a room for under 50 a night, at the Augusta Hotel. Normally it is more, but look for the “last minute specials” on their web page. They give a parking pass for street parking, but good luck finding a spot! Nearby are museums and supposedly a big train layout. This is my cup of tea, but time ran out. The breakfast buffet was included in my special. 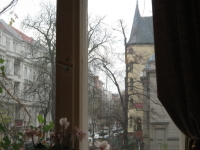 You sat in a nice old-world room with a view of the street. 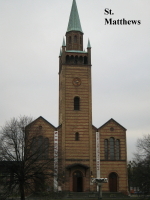 An easy walk away is the Gedächniskirche. This is the famous church with the bombed out tower, which they have left so. There is a museum area with interesting pictures. Look for the pictures of the same corner before and after the wicked Bomber Harris did his nefarious work. 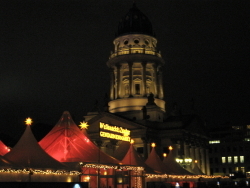 It was Christmas season, so booths were set up all over with red lights selling sausages and Glühwein. Wonderful. There is a continuing congregation meeting at the modernized adjacent facility. They were offering organ concerts followed by a short sermon. A couple people were outside passing out fliers to encourage the sausage-eaters to come in. The nearby musical instrument museum is so wonderful I dedicated a post of its own to it. The entrance to the general downtown or “Mitte” is the famous Brandenburg Gate, commissioned by Friedrich Wilhelm II to represent peace. Before entering the gate from the animal-park side, one finds the Reichstag building. 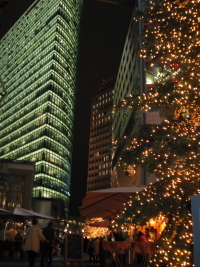 The center of this building has been rebuilt as a spiral walk that leads up to a a 360 degree view of the city. However, there is often a long wait, and the view was frankly not usually beautiful. Within the downtown area, the Gendarmen square is the highlight for beauty. The “Französischen Hof” was the church built by the Huguenots; the Germans, who never could accommodate themselves to the Reformed distinctives, had to match it with the “German” tower. Either way, they are very beautiful. Note the tents and lights set up in the market area in foreground for the Christmas special events. 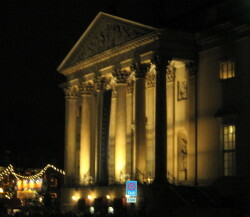 The opera Unter den Linden was nice, inside and out. Note the Christmas lights in the open area in background. Between it and the University is the site of the book-burnings that the tour books still lament. The book burnings continue today in the form of internet censorship. I will explain this more anon. We need to get back to book burnings. It can be very cathartic. The National Socialist book burnings were voluntary. The modern statist censorship is not. Checkpoint Charlie is still done up as if. There was a mob of people. The matter still generates interest. The wall photographs were quite moving. 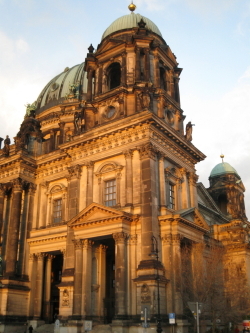 The Berliner Dom (Cathedral) had a concert that I attended on New Year’s Day. It was wonderful. A very fresh and youthful, yet precise, string ensemble. The cathedral is ornate beyond description inside. It is solidly Lutheran, yet there were racks for superstitious women to light candles (with the coin drop, of course), and iconography that can only lead to more of the same. The Spree River wends its way through the city. It is said that Berlin has more bridges than Venice! The east sections are being rebuilt. Way to the east is the Köpnick section. Here, in the early part of the 20th century, the shoe maker Wilhelm Voigt feigned himself as Captain, and actually took over the city hall. A memorial is set up, and a 1930s play about the story was actually running on the Ku-damm (I didn’t have time this time). The area has the potential to become a funky yuppie/art district, but for now, the graffiti gives it a burned-out feeling. 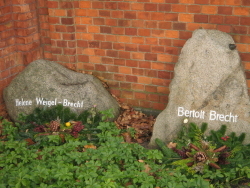 At the historic Reformed cemetery, I found Georg W.F.Hegel, and Bertold Brecht (with his concubine Weigel). In Germany, I guess, if the Romanists and Lutherans don’t want you, the Reformed are always there with open arms. Much more will need to be said about Brecht, because of his iconic status. Suffice it say for now: this is another ghost that desperately needs to be exorcised from the German psyche. I found the Grimm brothers in a more standard Lutheran cemetery. The young women, at least in the winter, wear boots over pants, giving Berlin the look as if full of horsewomen. Often they go shopping in pairs, and walk arm-in-arm. The last day I saw a pair that were as if marching in step, like a couple Prussian soldiers. But that’s not fair. They were definitely women. But they walk with a sense of purpose, even when shopping. There is no dithering around like young American women typically exhibit. My camera doesn’t do very well at night. I pledge to get more of a lineup in this department on the next trip. This entry was posted in Travelogue by TJH. Bookmark the permalink. In other words: German girls are cocksure materialist tramps like any other â€” but they don’t “dither”. ML — ouch! That certainly doesn’t follow from anything I said. However, I commend you for finding a discussion of Berlin today worth reading.